Info "Avoid Spiny! Just like-a Mario!" Spiny is one of 9-Volt's microgames in WarioWare: D.I.Y. 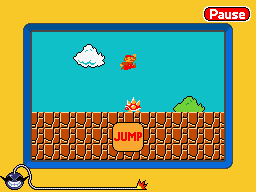 This microgame is based on Super Mario Bros. To win, the players have to make Mario jump over the two Spinies to avoid them. To do so, they have to tap the Jump button. If Mario's hit by a Spiny, the game ends in a loss. The message appearing in the game's beginning is "Jump, man! ", referring to Mario's alternate name, Jumpman, in Donkey Kong. This page was last edited on December 9, 2018, at 12:24.